After averaging roughly $63 million annually from 1949 to 1965 (more than 95 percent of which was economic assistance and food aid), average aid increase to $102 million per year from 1966 to 1970. 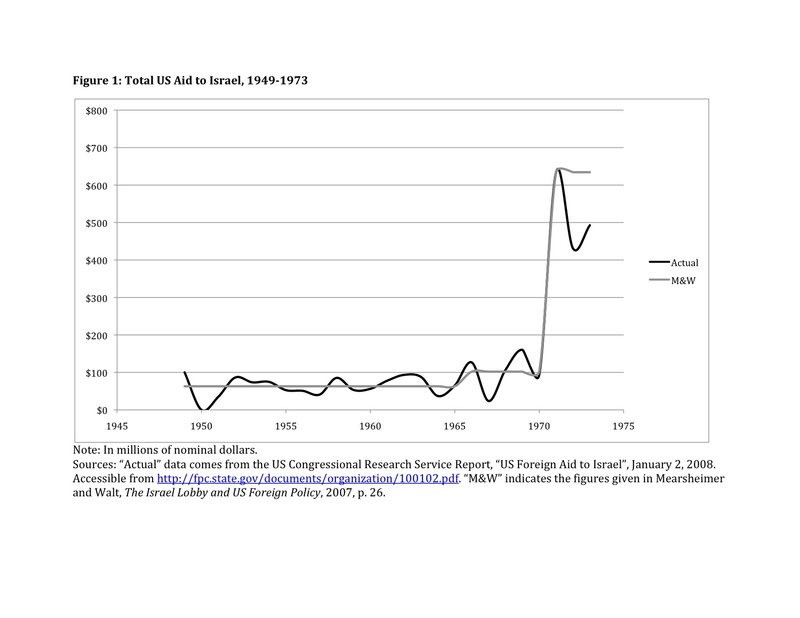 Support soared to $634.5 million in 1971 (roughly 85 percent was military assistance) and more than quintupled after the Yom Kippur War in 1973. Two things jumped out at me about this. The first was the word "averages" being used for time periods of unequal length. Given the way that mean averages work, it is easy to distort figures to seem artificially high or low by stretching them out over time. For example, if I have pizza 14 times in one week but then don't eat it for three weeks, I could make this seem artificially low saying I had it an average of three times a week (OK, so not that low). Alternately, I could make it seem artificially high by saying I had pizza an average of twice a day for a week. This becomes even more misleading if we were to compare the one week in which I ate pizza to the three weeks in which I didn't--akin to Mearsheimer and Walt's comparison of a few really high aid years to long periods of low aid. The second thing that got my attention was the presentation of several bits of numerical data simultaneously (years, dollar amount averages, and percentages) without the use of any sort of graphic. Even a basic table would've been nice. Units are important here--the Mearsheimer and Walt figures distort aid amounts to the tune of hundreds of millions of dollars. Does this discredit their overall point that aid increased dramatically? No, but they could've presented it in a more accurate manner. I'm not saying they have to go full-bore and do a regression-discontinuity design, I don't think it's too much to ask for a simple graphic like this that takes just a few minutes work. Data visualization is too important and too convenient nowadays for serious scholars to ignore. And according to the New York Times, we're going to need a lot more people with these skills in the future. Since I've got the data, I'm happy to share it. 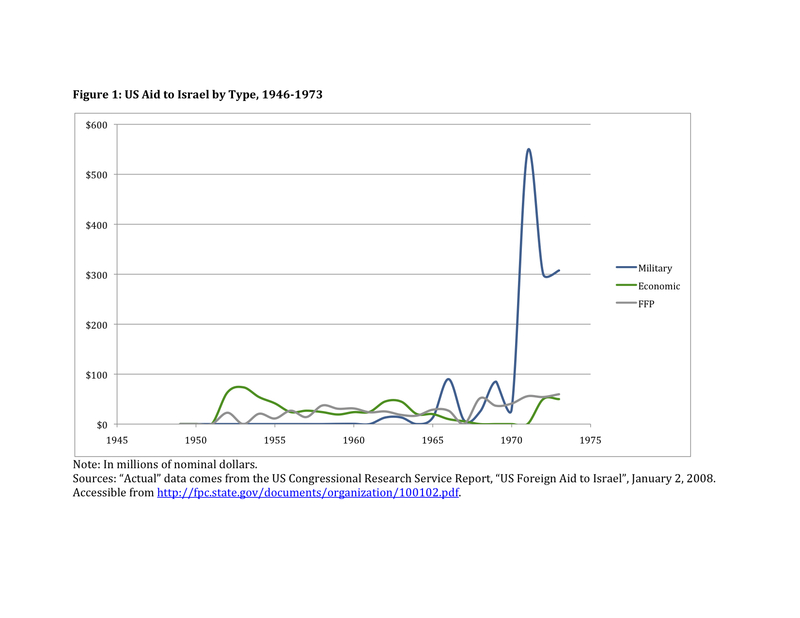 I may run a couple of other graphs from it too--military/econ/food as percent of total aid over time, and grants vs. loans over time (Mearsheimer and Walt make the point that the US switched to loans so that Israel didn't have to be supervised, but that we forgive all of the loans so they might as well be grants). This could also be extended to 1996 with the data I've currently got. Look for more blogging on US-Israel relations as I continue the book. As always, comments welcome.